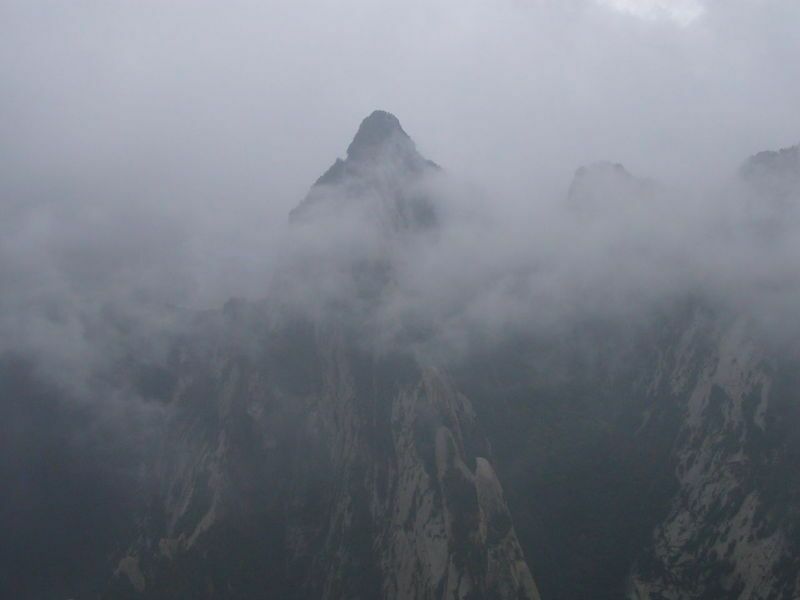 As one of the five well-known mountains in China, Mt. Huashan is located in the south of Huayin city, 120 kilometers east of Xi'an, Shaanxi province, with an elevation of 2200 meters above sea level. In the ancient times, Mt. Huashan was called Mt. Taihuashan. But seen from afar, the five peaks looks live five petals of a flower. Hence, Mt. Huashan. Today, it is listed as one of the renowned national scenic spots. Mt. Huashan is famous for its breath-taking cliffs. Along the 12-kilometer-long winding path up to the top are awe-inspiring precipices, a look upon which might make you hold your breath. Among the five peaks, East Peak (Facing Sun Peak), West Peak (Lotus Peak) and South Peak (Dropping Goose Peak) are comparatively high. Standing at the top of East Peak, one can enjoy the rising sun early in the morning. West Peak, in resemblance to a lotus flower, is the most graceful peak in Mt. Huashan. In addition, there are Middle Peak (Jade Maiden Peak) and North Peak (Clouds Stand). It is said that once a young lady rode a white horse among the mountains. North Peak, like a flat platform in the clouds, is the place where the story Capturing Mt. Huashan Wisely took place. Mt. Huashan boasts a lot of places of interests. Here and there stand Buddhist and Taoist temples, pavilions and buildings as well as sculptures and engravings. Of the ruins, Yuquan (Jade Spring), Zhenwu Palace, and Jintian Palace are, comparatively speaking, famous. Xiyue Temple, 7 kilometers north of Mt. 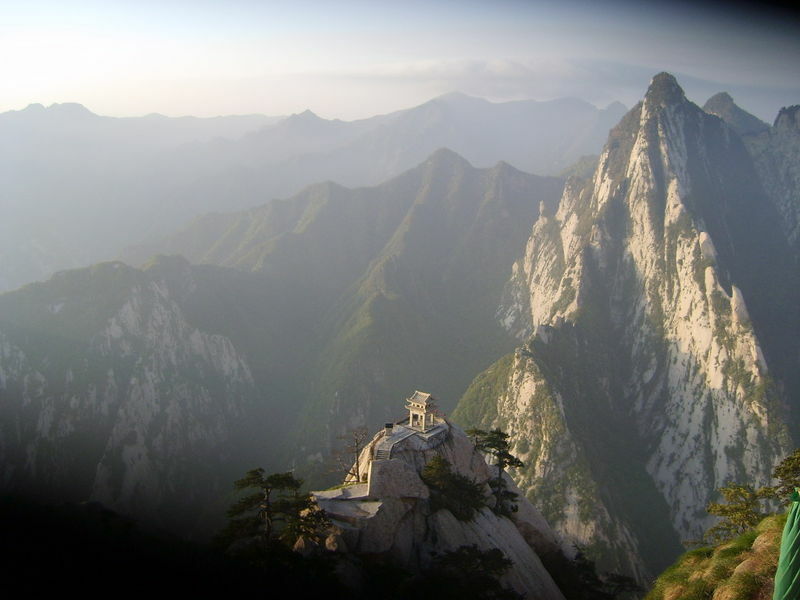 Huashan is the place where people of ancient times paid tribute to God Mt. Huashan. Along the cliff of South Peak is a plank road equipped with an iron chain, with the help of which the adventurers can have a walk on the frightful path. There is a giant rock in front of Cuiyun Palace on West Peak. As it takes the shape of a lotus flower, the mountain is also called Lotus Peak. 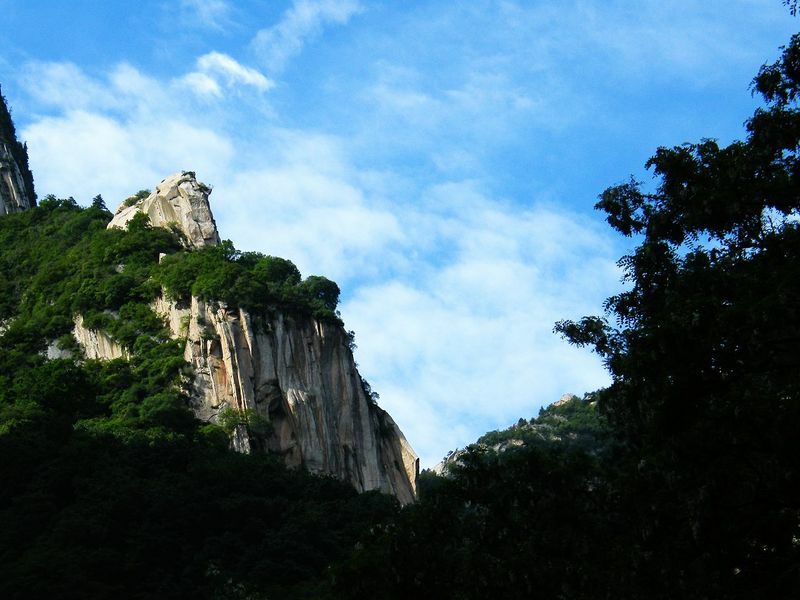 As legend has it, Chen Xiang, a filial young man, once split the mountain and rescued his mother out of it. Now a crack can be witnessed in a giant rock beside Cuiyun Palace as if it was made by an axe. Thus, the rock is called "Axe-splitting Rock," beside which is a huge axe with a long handle. The northwest side of the peak is called Fatal Cliff for it is as steep as if cut by a sharp sword. North Peak, with cliffs on three sides, has only one road leading to the south. From here one goes south to Ca'er Precipice, the fourth dangerous place along the only-existing path in Mt. Huashan. The cliff, less than 30 centimeters wide, faces such a deep valley that the tourists have to edge along carefully. Then one comes to Sky-leading Ladder, Sun and Moon Precipice and the well-known Blue Dragon Mountain. East Peak, with a rising-sun platform favorable for a sight of the morning sun, is also called Facing Sun Peak. As the sun emerges from the sea of clouds, one cannot help showing his admiration.